Nearly all of the modern Audio Visual equipment has the capability to be connected to a home data network. In some cases this is for access to the internet for online services, and for others it is to allow you to link and control it from a personal tablet computer or smart phone. As a result Home data networking is rapidly becoming the heart of the home, and is used to connect very many devices either via WiFi or a wired connection. It means of course that a reliable network and WiFi signal is becoming more and more important, as it affects the operation of everything connected to it. With more and more streaming services becoming the channel of choice for watching TV, Movies and listening to music, it is more important than ever that the Home Network is robust and reliable. The simplest solution is of course a basic WiFi router such as supplied free from one of the major telecoms companies with the broadband package. For a simple system this may prove perfectly sufficient if there are few connected devices, however if there are bandwidth hungry devices on the network such as digital streaming servers and players, A bit more care and more capable products may be required. This is using the ISP WiFi Router, with a connected computer for access to the internet etc. The Linn DS simply plugs into the router, has access to the Internet, and can be controlled either from the local computer, or from a device connected via WiFi. This is the simplest of installations, and assumes there is nothing or little else connected to the network. Here the music portion of the Data Network is separated from the ISP router via another router. This has the advantage that the Music network traffic is kept away from the ISP router, and broadband traffic not on the music network (e.g. video streaming) does not affect music playback. 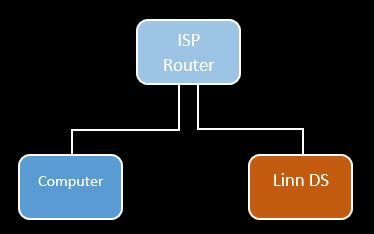 The main network router is more capable than the regular “free” ISP supplied router, and is better able to organise connected devices. This router will typically also be WiFi enabled for portable devices. With the advanced home network setup, devices are connected by a managed network switch. This is used to ensure that high bandwidth streaming traffic is not broadcast unnecessarily over the WiFi, which would slow the network down. 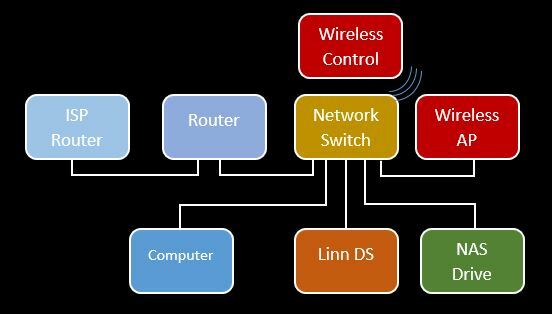 This type of network setup can be scaled up significantly to cover many rooms and include multiple access points for the WiFi coverage required. We are also able to offer managed WiFi solutions that allow roaming across WiFi access points. 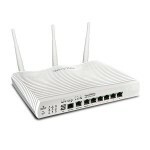 This provides a seamless WiFi enabled access to your network and the Internet. Using separate routers and WiFi Access points means that each of these devices are more capable and the whole network is more robust and reliable. The Network can also accommodate other services such as Voice over IP (VOIP), CCTV, Home Automation / control etc. We have become experts in Home networks to support our Multi-room audio and video solutions, and Home Automation, so our solutions often provide you with a highly capable and robust home network. Whether it is for simply watching BBC iPlayer on the TV, or for a Whole Multi-room audio and Home Automation System Come and talk to us about your home network requirements. If we know how you plan to use your network, we can design it to ensure you can have seamless music and video streaming without interruption to internet traffic or other services.